What a rag-bag of singular happenings! 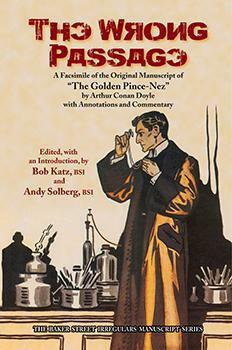 Edited by Bob Katz, BSI, and Watson's Tin Box member, Andy Solberg, BSI, ASH, this newest publication in the BSI Manuscript Series (click the picture above for a link to the Baker Street Journal webpage) provides a facsimile of the original manuscript of "The Golden Pince-Nez," along with annotations and commentaries by noted Sherlockians. Many members of Watson's Tin Box were involved in this worthy project, from photographs by Beth Austin, ASH, of the evidence box from the late Paul Churchill's collection, to contributors John Baesch, ASH, BSI, Denny Dobry, William Hyder, BSI, and Jacquelynn Morris, ASH, BSI. for an interview with the editors of The Wrong Passage.